Finding a great mouthpiece can be a lot of work. Most solutions lie in practicing and developing a good sound, not in changing your set up. Many players don’t like their sound and go out and buy new mouthpieces only to delay the resolution of the problem. If you can not play with a good sound buying a new mouthpiece will not suddenly fix everything! It may make things worse or at least more complicated. Practice long tones for at least a month before deciding the problem is in your set up. If you do have to look for a new mouthpiece, the best advice is to find something that works and stick with it (although keep in mind that mouthpieces can need replacing after a few years of use). Here is some gathered information to help you in the arduous task of finding a mouthpiece to use. The first thing to know is that mouthpieces come in all shapes, materials, sizes, brands, and styles. Below is a chart we’ve compiled listing the different tip openings for models of different brands. This Chart is definitely not complete. Numbers in ()’s are actual sizes. Contact us if you have other, or better information! Tip Openings are measured in 1/1000 of an inch. The below article is mostly referring to Baritone Saxophone mouthpieces. Alto players have the Meyer, Tenor players have the metal Otto-Link, but baritone players don’t have a single common/standard mouthpiece that is sought after by everyone. (Not that I recommend using the most common mouthpiece). However, the most common brands I see for baritone are Berg Larsen (metal and rubber), Meyer, and Otto Links (usually metal). I have noticed recently that the variety of mouthpieces being used in the last few years is definitely expanding. Hopefully this is a continuing trend. The time honored “beginner’s” mouthpiece is the Selmer C*. This is also a very common mouthpiece with classical saxophonists, however someone playing anything other than strict classical music might benefit from a mouthpiece with a larger tip opening and chamber. Pepper Adams used a metal Berg Larsen, Gary Smulyan uses a vintage metal Link, Scott Robinson uses a hard rubber Vandoren, and Ronnie Cuber uses a custom made metal Francois Louis. Gerry Mulligan and Harry Carney generally used rubber mouthpieces. You can find out what your favorite players used and use that, but there is no guarantee that their type of mouthpiece will work for you or sound at all like it did when they played it. Everyone’s embouchure is naturally different. The diameter of your throat, the density of your teeth and bone, the size of your tongue, the length of your throat, the size and shape of your lungs; these thing are all different and all affect the way the air vibrates when producing a sound on your saxophone. 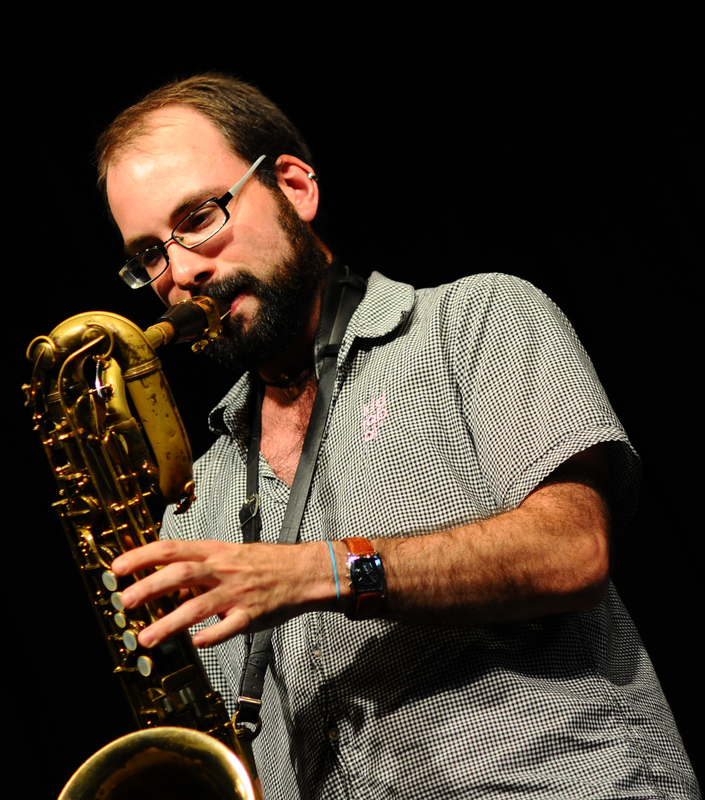 The saxophone doesn’t just vibrate air in the horn, your entire air column is vibrating, and the room you are in are contributing to the sound. So do not be surprised if even with the exact same set up as your favorite player that your sound is quite a bit different. There are both new and vintage mouthpieces out there. A large difference between the two is that vintage mouthpieces were hand crafted. Unlike the horn itself, it is actually possible to find modern hand finished mouthpieces today. Newer mouthpieces tend to be far more consistent from one mouthpiece to another of the same model, because most of the work is done with precision machinery, although many modern mouthpieces are hand finished, or even hand made if they are from a custom mouthpiece maker or smaller brand. Having a newer mouthpiece means that if you find a new mouthpiece you love and you lose it or break it, you can buy another and easily replace it. However, with vintage mouthpieces you have a chance that it will be unique (or flawed) and that difference might give the mouthpiece a special sound. Although this makes the mouthpiece nearly irreplaceable. Unlike horns, I believe that some of the newer mouthpieces can definitely hold their own against vintage ones. Vintage mouthpieces are far more fragile (especially rubber ones) and can be far more expensive. Newer mouthpieces tend to be much more reed friendly and forgiving to reeds, as they are more physically symmetrical and well defined. The bottom line of course, is that nothing matters more than if it sounds good or not. There are a few things to remember when trying out mouthpieces. First, if possible, try and keep the conditions and variables the same between all mouthpieces to give a fair comparison. Don’t change rooms, don’t change horns, use the same reed, same ligature, and play the same things to try each mouthpiece. This is tricky as a more open mouthpiece will need a softer reed and if you try them in different stores or rooms the sound of the room will undoubtedly be different. Do the best you can, bringing a small recording device is not a terrible idea. Bring a tuner! See how the mouthpiece plays in tune on your horn. Most mouthpieces and horns will sound and play best when they are adjusted to be in tune. Most importantly: Try as many as possible! Many online sites will send you a few (after you pay for them) and allow you to try them for an extended period and send them back for a full refund if you do not like them. Also, many mouthpieces are hand finished, so if you find a mouthpiece you like and want to purchase see if you can try out 2-3 of the exact same mouthpiece, they will each be slightly different. Most stores will let you try any mouthpiece before purchasing as well. The tip opening is the distance between the reed and the tip of the top of the mouthpiece. A good starting place for baritone is around .090 inches (around a 5 on the ‘Otto Link’ sizing scale). But everyone’s mouth, teeth, tongue, palate, etc. are all different. A wider (more open) tip opening generally requires a softer reed, while a smaller, or more closed opening, will require a harder reed. A medium-open set up would be .110 inches opening with a strength 3 or so reed (although remember strengths are not consistent between brands). Its a good idea to try many different tip opening to see what you can handle and what you like. If the tip opening is too large it will seem very hard to produce a clear tone, or sound extremely stuffy or fuzzy. If you are trying a mouthpiece more open than you are comfortable on it may squeak quite a bit because it is harder to control. It is important to note that using a harder reed as opposed to a larger tip opening are not exactly the same. Both options provide more resistance, but a small tip opening with a really hard reed will have a different sound, timbre, and feel than a wide tip opening with a soft reed even though they may have similar resistances. Most saxophonist tend to only consider the tip opening when looking at mouthpiece specs. This neglects two things that can have a huge effect on the way a mouthpiece plays and sounds – facing lengths and rails. Clarinetists tend to be much more concerned with facing length and rails than saxophonists, I’m not sure why but I have noticed this. The facing length refers to the distance from the tip of the mouthpiece to where the reed actually begins to touch the rails of the mouthpiece. This distance can vary greatly. A longer facing will reduce resistance (meaning you can use a harder reed) whereas a shorter facing increases resistance. A good analogy is like a diving board, the longer the board, the more flimsy and less resistant to bending it becomes. And while a shorter facing and a wider tip opening both lead to additional resistance you can’t exactly substitute one for the other, they affect the feel, articulation, response and sound quite differently. The width of the rails can vary quite a bit from one mouthpiece to another. Not only the side rails but the tip rail at the top of the mouthpiece as well. The rails of the mouthpiece are what the reed actually vibrates against and bounces off, so they are responsible for producing the actual vibration of the air! Thicker rails increase resistance and can slow down articulation and response but will provide a deeper, warmer and possibly richer sound. Thinner rails are better for quick articulation and ease of response. So as you can imagine the combinations between tip openings, facing lengths and rail widths are nearly endless. Especially when you consider the shape of the facing curve even for two tip openings can be completely different. And we haven’t even discussed baffles and chambers yet! Before we dive in, let me definitively say – the design and shape of the mouthpiece (baffle + chamber) will affect the sound (brighter/darker etc) far more than the material its made from! Not all metal mouthpieces are bright, and in fact some hard rubber mouthpieces can be incredibly bright and loud! There are several materials used for mouthpieces including metal, plastic, glass, wood, and hard rubber (ebonite). Metal and hard rubber (ebonite) are by far the most common materials used for baritone saxophone mouthpieces. There are a few basic differences between hard rubber mouthpieces and metal ones. Metal mouthpieces are much less fragile as they can be washed with anything, they wont crack, and wont shatter if dropped. Plastic mouthpieces are usually worthless and just for students, they may come in the case with a new saxophone. Glass mouthpieces are extremely rare, especially among baritone mouthpieces – they are much more common for clarinet. Wooden mouthpieces are somewhat rare as well, and can sound great, but may be hard to keep in shape and may be expensive. They are affected greatly by changes in humidity (weather) and are prone to cracking. The difference in sound depends mostly on the chamber, curve of the facing, and tip opening, baffle, chamber etc, as opposed to the material. Metal mouthpieces are often perceived to have a brighter tone while hard rubber mouthpieces tend to be much darker and mellow. This is not necessarily because of the material they are composed of, but often metal mouthpieces are designed to project a bit more. A good example of the difference is Pepper Adams Vs Gerry Mulligan. Pepper played with a very bright sound using a metal mouthpiece with a baffle while Mulligan’s sound was much darker – he used a large chamber hard rubber mouthpiece. Baffles and different chamber sizes are used to alter the speed of the air as it travels through the mouthpiece, thus changing the sound. 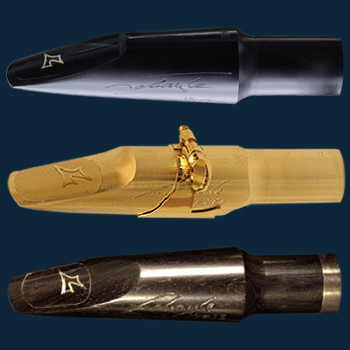 A baffle refers to when the inside of the mouthpiece below the tip opening is raised in a variety of shapes and sizes. This generally creates a more narrow opening which forces the air through faster, and creates a brighter sound. High baffles are fantastic for when you need punch in your sound or to play extremely loud – highly recommended for rock and salsa gigs. There are a few mouthpieces out there with a movable baffle, although none of these have been considered more than a novelty. Baffles can be added or removed to existing mouthpieces by skilled craftsmen. Different chamber sizes can have similar effects to baffles. The chamber is the inside of the mouthpiece towards the bottom of the mouthpiece. A large chamber slows down the airspeed, and will usually create a much darker sound. A small chamber generally produces brighter one. A large chamber may provide more resistance as well. When you see two numbers in the size of the mouthpiece (e.g. 100/2) the second number (2 in this case) is the size of the tone chamber (inside of the mouthpiece). The larger the number the larger the chamber, and darker the sound. Note that a larger chamber may also affect the tuning, as it increases the volume inside the mouthpiece, thereby slightly altering the pitch. Mouthpieces, especially metal ones, don’t need much care, but they do need to be looked after from time to time. It is a really good idea to swab out your mouthpiece every other, if not each time you use it. If saliva is left on the mouthpiece after playing, it can form over a period of months into calcium (carbonate) deposits which look like a crusty white substance that is extremely hard to remove. 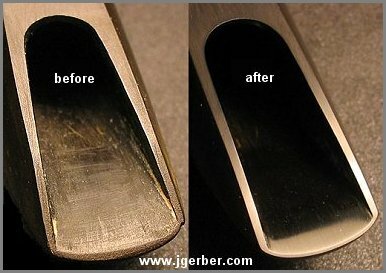 Scraping these deposits off can possibly harm the mouthpiece and if untreated they can eventually build up to the point where they will interfere with the mouthpiece’s performance. Here’s a site with more information concerning this malady. The best solution is to not allow the build up in the first place. There are some people that swear by soaking a mouthpiece in liquids such as vinegar can remedy this, but best to avoid having to soak your mouthpiece in anything. Some people prefer to leave their reed on the mouthpiece, rather than putting their reed away after playing. This is a very sure way to build up the calcium deposits and can ruin a good piece. It is also best to wash your mouthpiece occasionally. However if you mouthpiece is a hard rubber mouthpiece, wash it only as often as you need, and only with room temperature water! Be sure to use only water, not soap. Hot water can cause certain materials in the rubber to leech out, specifically the sulfur used in the firing process that hardens the rubber. You may notice that it turns green after you wash it in warm water – this is not a good thing. This is evidence that some of the materials used to make the mouthpiece are leeching out. Metal mouthpieces are much less fragile and can be washed with soap and warm water. It is even possible to scrape out calcium deposits in a metal mouthpiece without too much harm. On thin rubber baritone pieces the most fragile place is sometimes the shaft or shank where the mouthpiece fits onto the neck. It is very important not to force a rubber piece onto a neck cork that is too thick. Always use cork grease, use a twisting motion, and don’t force it! If the shaft does crack it can sometimes be repaired and have a ring placed on the end of it. However, mouthpieces with this kind of damage are rarely repairable. Some new mouthpieces come with a ring already on the end to protect against this type of damage. If a mouthpiece is dropped and chipped it can sometimes be repaired by a skilled mouthpiece repairman using different materials. Hard Rubber mouthpieces can wear out in as little as a few years if played a lot. If you find that the same reeds you’ve always been using seem to be getting worse, less reliable, or strangely softer this could very well be a sign that your mouthpiece is starting to wear out. If possible find a new version of your exact mouthpiece and try it out to see there is a large difference. When to replace a mouthpiece? I am often asked how long a mouthpiece lasts. Well that depends on a lot of variables that are different for every person. Do you play every day? How many hours? Hard/resistant set up? Do you wash the mouthpiece? Do you bite hard? In general metal mouthpieces will last longer than hard rubber mouthpieces. Hard rubber mouthpieces can be tricky to gauge, because they don’t just suddenly stop working. They will slowly change over time, almost like how a saxophone slowly begins to go out of adjustment and leak. You may not even realize until its in terrible shape, or until it is tuned up and you feel the difference! As mouthpieces age the facings can tend to get shorter as the facing curve is slowly flattened out, and the rails can be become much less crisp and no longer symmetrical as the wood reed is vibrated against them thousands of times every day. You may find that older mouthpieces are much less reed friendly – often times people with vintage mouthpieces think reeds are far worse than they are because they need to find a reed that works with their worn out/asymmetrical rails. Generally I think people playing hard rubber mouthpieces that play fairly often should consider a new mouthpiece, or at least make sure theirs is still in good working order after 3 or 4 years – maybe more if there is not too much wear. As your embouchure progresses you may find that your mouthpiece is restrictive. The reed seems to clamp shut when you try to put your full air through it, and all reeds seem too soft. It may be time to get a mouthpiece with a larger tip opening. Or perhaps your mouthpiece has gotten older and a bit worn – the rails are soft and uneven and maybe a chip or two has developed. 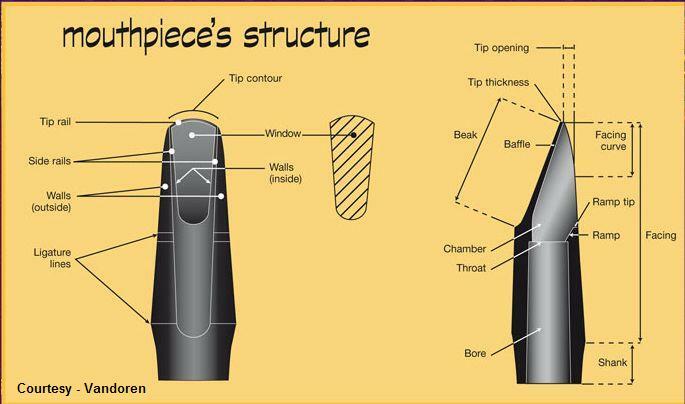 If you love your mouthpiece and can not find anything as good, you can have a skilled mouthpiece craftsman “reface” the mouthpiece and give it a larger or smaller tip opening, or redo the rails. This is a risky thing to do and will certainly change the way the mouthpiece plays, perhaps not for the better. A baffle can also be placed in a mouthpiece. There is no end to how a mouthpiece can be customized, modified, etc. But it is certainly costly, and it might be easier to find a new mouthpiece entirely. An older mouthpiece that is beginning to wear down may also be refaced to restore symmetry and increase its consistency. 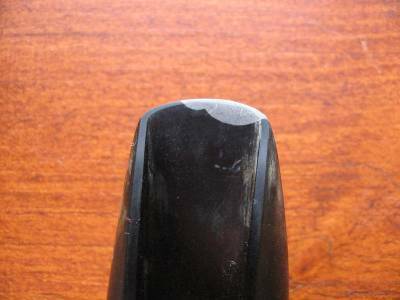 One thing to consider – if you take a vintage mouthpiece and reface it – is it still really a vintage mouthpiece? The most important part of a mouthpiece is the facing curve, tip opening and rail design. If you remove all of these the only thing in common with the other vintage pieces is the basic material, which as we discussed is secondary to the geometry of the mouthpiece. Mouthpiece prices vary greatly. Student baritone mouthpieces can cost as little as $90 and a new custom mouthpiece can be as much as $900. Vintage mouthpieces depending on their desirability, age, and condition can be expensive or extremely cheap. Do not let price determine its value, there plenty of great mouthpieces out there for well under $300. Remember, the most important thing is how it sounds and how it plays. WWBW.com – Woodwind Brasswind has many new mouthpieces for sale, and has a trial period. Saxquest.com – Has a large variety of vintage mouthpieces. Theo Wanne’s website – information about mouthpieces. I was browsing the web trying to find some kind of reasonable info on mouthpieces, and this is a goldmine!! I recently started playing again after a decade plus layoff, and man have things changed over the last 40 years. There are many many more mouthpiece makers and brands out there, but very little if much at all in the way of true and honest information concerning mouthpieces. I have consulted with several of the industries so called gurus about a new mouthpiece, and while they are more than willing to “sell” me a product, the customer service leaves a hell of a lot to be desired. Thanks for some thing real I can wrap my brain around, and keep up the good work. This is one of the best sax related websites on the Internet and I have looked at almost all of them in the last 12 months!! Seeking a vintage MC Gregory HR L.A. or Master Hollywood 4A 18 or 5A20 for my 1928 CG Conn Bari with full pearls,alternate fron F key,G# trill key,split lower keys and gold plated original neck. There is also something else which needs to be talked about here. There are some vintage baritone saxophones that refuse to play in tune with modern mouthpieces. I have personally experienced this with a 1964 Conn 12M and a Martin from 1934. These mouthpieces not only want a large chamber, but also a long chamber. Both of these horns play hopelessly sharp with Yamaha 5C, Rico Royal Graftonite and Metalite, and a Selmer C*. Even when pulled to within a 1/4 inch of the end of the neck they were still sharp and the octaves were way out of tune. When a Vintage Conn Precision 2 was used it could be pushed on 5/8 inch and the octaves were perfect. It actually played well on both horns. Next I tried a 1969 Brilhart Level Air with the same result. The chamber in the Conn had no step whatsoever inside and was rounded all the way to the side of the rails. So it acted very long. The Brilhart Level Air has the end of the baffle 3/4 of the way down inside the window so its internal tuning length was very long also. The modern mouthpieces all had their transition step well beyond the window so their tuning length was short and would not work on these Vintage horns. So it seems sometime in the late 1960’s or 70’s bari saxes underwent a change in overall length. My advice is if you have a vintage bari sax is to look for a mouthpiece of the same era if you hope to play in tune. Don’t be surprised when that $600 modern mouthpiece refuses to play in tune on your old Conn or Buescher bari sax. BTW I asked Jerry mulligan what he played and it was a Conn 12M with a Conn Precision 2 hard rubber mouthpiece. He also told me he dropped it and broke it and had to have it repaired because he couldn’t replace it. He ultimately found another old one had had it resurfaced for him. This is something a lot of baritone players have noticed, but I think it would be good to note that it is not universal. There are many pre-1960 baritones that work really well with modern mouthpieces. Also its should be noted that Conn made Low Pitch and High Pitch horns. While the High pitch were far less common, a high pitched horn is not going to play close to modern tuning with any mouthpiece really. There is a L or an H near the serial number to indicate the type of horn respectively. I have a Conn 12M and was not happy with the Otto Link 7* I was using. On reading this article I located a Conn Precision 2 mouthpiece at a very reasonable price. I don’t think I could be more pleased with a mouthpiece. Thanks for the heads-up! Interesting that Gerry Mulligan used the same piece. I have a Conn 12 M from the early sixties. It played sharp with a Link Super Tone Master, so I had about 3/4 ” added to the shank and it now plays in tune (and octaves are OK). This is probably a better fix than lengthening the crook (which I’m told some people have done). For a new hard rubber mouthpiece note that Pete Thomas’s PPT mouthpieces are made to order so can be made with a longer shank if necessary (although he says that the normal length works OK with a 12M in his experience). I agree, lengthening a mouthpiece or a neck seem like much less drastic and permanent solutions than altering the crook or receiver. I play a Pan American (unknown date, but it has a forked Eb) and my student has a 1954 Martin. I had the shanks of 2 mouthpieces extended – a Rico Metallite and a Greg Wier – and got on with life in general. My student seems to spend every waking hour searching for the perfect mouthpiece and his collection is expanding at an alarming rate. He came to a lesson last week saying that he’d spent four hours on the net researching mouthpieces. I pointed out that he’d probably sound better if he even spent half that time practicing. I too have a 1952 Conn12m Crossbar, and upon having the neck measured up, had 1/2″ added to it’s length. Then it’s length (neck) was compared to horns owned by other players, I was shown the results, and of course played the horn. Now, the mouthpiece didn’t hang-off the end in order to be in tune, and with my old Link or Berg, it was just fine ( it’s been just fine for 20 years). I was told by the repair tech in London, U.K. that this was not an uncommon careless error by Conn back in the day. Harry Carney et al have been teachers for years and years!